Hellidon Lakes Golf & Spa Hotel, Daventry, United Kingdom - Lowest Rate Guaranteed! With a stay at Hellidon Lakes Golf & Spa Hotel in Daventry, you'll be on a lake, and 19.8 mi (31.8 km) from Warwick Castle and 19.3 mi (31 km) from Warwick Racecourse. This 4-star hotel is 19.4 mi (31.2 km) from University of Northampton and 20.4 mi (32.9 km) from Silverstone Circuit. The bowling alley, food and conference facilities. The room allocation was excellent. 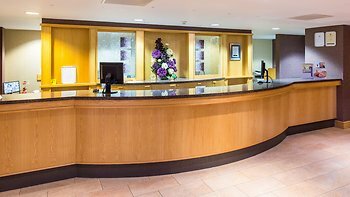 Reception staff were a joy to deal with and were most helpfull in finding our way around both the hotel and the local area. Breakfasts were excellent. I will certainly recommend the hotel to friends for a short restfull break. Room cleanliness was somewhat tardy after the first night. Bed-making was very untidy each day and we had to strip and re-make the bed before we could use it that evening. All the staff were extremely helpful, chatty and wanted to be of service. Peter the Leisure manager was very helpful and Luke and Holly in the dinning room were chatty, helpful and made us feel very comfortable. The range of facilities was very good. The setting beautiful. Excellent food for dinner and breakfast. This was a last minute booking. The staff were excellent, extremely helpful and accommodating. The food was wonderful, from a sandwich at lunchtime on arrival, breakfast and evening meal. Even with a very young baby, nothing was too much trouble for anyone. We would thoroughly recommend this hotel and thank the staff very much for making our stay so enjoyable. We hope to return, bringing friends with us, soon. The peacefulness of the surroundings and helpfulness of all the staff. The exterior was a little disappointing on arrival, only in so far as it was not how one would have imagined (the new building looks a little like Prisioner Cell Block H on arrival from the drive!). WITHOUT EXCEPTION ALL OF THE STAFF WERE PROFESSIONAL AND FRIENDLY AND THEY COULD NOT DO ENOUGH TO HELP US. FANTASTIC SETTING AND BEAUTIFUL FOOD. Beautiful location with mle parking and very nice breakfast. No proces on the evening menu which put is off eating there.